Secretary of War Edwin Stanton looked in amazement at the six young soldiers before him. It was March 25, 1863, and the sight of ragged remnants that had once been brave young commandos moved his heart. They had just been released from a Confederate P.O.W. camp in a prisoner exchange, and their story was incredible. Undoubtedly the Secretary had some prior knowledge of the ill-fated mission these brave Ohio volunteers had embarked upon just a year earlier, but the details of that mission and the commandos' subsequent imprisonment exceeded his expectations. The youngest member of the six was Ohio Army private Jacob Parrott, though he was not the youngest of the original group. The whereabouts of 17-year-old James (Ovid) Smith was still uncertain. He had been captured near Huntsville, Alabama, before the mission had begun, then escaped the previous October. Nineteen-year-old Samuel Robertson's fate was not so unclear....he had been hanged by the enemy for his role in the daring commando group that became known as 'Andrews Raiders'. The original mission had been proposed by 33-year-old Virginian and Union spy James J. Andrews, and quickly embraced by Union Generals Buell and Mitchell. In fact, Brigadier General Ormsby Mitchell was so enamored with the plan that he personally joined Andrews when he went to three Ohio regiments on April 7, 1862 to enlist volunteers for the daring foray into enemy territory. In all, 23 young soldiers volunteered their services despite Andrew's very limited briefing. Before the mission unfolded, a 24th man joined the group. He was civilian William Campbell who happened to be visiting his friend Private Philip Shadrach at the time. When Shadrach volunteered to join the effort, the 200 pound William Campbell volunteered to join also. The brave soldiers were told little more than that they should separate into small groups and travel separately through enemy lines to Marietta, Georgia, deep into the heart of Dixie. Four days later 21 of the volunteers had successfully arrived to meet Andrews in the small city just north of Atlanta, and the plans for their daring raid unfolded. Their mission was to purchase tickets as passengers on a Confederate train, then take control of that train and travel north 100 miles to Chattanooga wreaking havoc and burning bridges along the way to disrupt Confederate troop movements and communications. At 5 A.M. the following morning Andrews and 19 of his volunteers boarded the passenger cars behind the steam engine General. (For whatever reason two of the volunteers failed to meet their train.) It was April 12th, one year to the day after the opening shots of the Civil War had been fired at Fort Sumter. A short time after the train left Marietta it pulled into the small stop at Big Shanty where the passengers and crew dismounted for breakfast at the Lacey Hotel. Andrews and his 19 men stayed aboard, prepared to make their move. There was no telegraph office at the stop in Big Shanty to broadcast news of what the raiders were about to do, the very reason Andrews had selected this site to begin his operation. When the passengers and crew were out of sight Andrews and his men calmly but quickly separated the General, its coal tender and three box cars from the rest of the train, all without arousing the suspicion of the soldiers at nearby Camp McDonald. It was a simple but audacious act. Their work done, sixteen of the commandos boarded the three box cars. Andrews entered the engine with Privates Wilson Brown and William Knight, both engineers in their own right. The final soldier assumed the role of fireman and the legitimate crew of the General looked up from their breakfast to the startling sight of the General leaving Big Shanty without them. The courage of Andrews and his men this day would, however, be challenged by the courage of their enemy as well. The General's engineer Jeff Cain was joined by two of his crew Anthony Murphy and William Fuller in a desperate effort to recover their train. The three ran after the train on foot, pursuing it for two miles to Moon's Station where they found a hand-propelled cart to continue their pursuit. Over the first twenty miles of their journey north from Big Shanty, Andrews and his men took time to pull up rail behind them and drop timbers across the tracks to discourage any possible pursuit, as well as cutting telegraph lines that might have sent news of their desperate mission ahead to waiting Confederate troops. As they passed the Etowah River however, they made a fatal mistake, ignoring the presence of the old steam engine Yonah as they continued on towards Kingston. Cain and his crew didn't overlook this more appropriate pursuit vehicle and quickly traded their hand car for the aging mechanical one. At Kingston the raiders had faced a frustrating delay caused by other train traffic. Confident that the cut telegraph lines had prevented news of their raid from reaching Kingston they patiently but nervously paced the siding as the flow of south-bound trains held them in place. They were still not aware that Cain was pursuing them and gaining mileage with each minute of delay. Finally, after more than an hour, Andrews and his men continued their journey north, just as Cain was arriving at the rail yard. The two groups were only ten minutes apart. At Kingston Cain, Fuller and Murphy traded the aging Yonah for the William R. Smith to continue their pursuit. Four miles north of Kingston however, they had to abandon the William R. Smith when they encountered track that had been taken up by Andrews' Raiders shortly after they had departed the city. Refusing to give up, Murphy and Fuller ran on foot the 3 miles to Adairsville where they encountered a southbound train pulled by The Texas. Releasing the cars, the two continued their pursuit, The Texas running in reverse but gaining on the raiders. Two miles north of Calhoon Andrews halted the trek of the General long enough to again attempt to damage the track to foil any possible pursuit. As the dismounted raiders were going about their work they became aware for the first time that the pursuit was real. Quickly the men re-boarded and Brown and Knight opened the General's throttle to the maximum. Still running backward The Texas continued, also running at full steam in what would ever after become known as the Great Locomotive Chase. Through the towns of Resaca and then Dalton the two engines raced. The raiders dropped timbers behind them but they failed to slow The Texas. In desperation the raiders cut loose two of the three box cars, but even these failed to halt the determined pursuit. Just south of the covered bridge over the Oostanaula River the 21 raiders crowded onto the General and its coal tender and set fire to and released the remaining box car in an attempt to burn the wooden bridge. Still soggy from the rains that had earlier delayed the raiders initial journey into Georgia, the bridge refused to ignite and the chase continued. As it became increasingly more obvious that The General would not make Chatanooga the raiders began to jump one by one from the train and race for the shelter of the woods. Then, two miles north of Ringgold and just five miles from Tennessee, The General gasped its last puff of steam and the remaining raiders ran in desperation to avoid capture. The Great Locomotive Chase was over and the flight for life had begun. Within a week Andrews and all 21 raiders, including the two who had failed to board the train for its 87-mile race into history, were captured. In Atlanta James Andrews was tried and convicted as a spy. On June 7th he was hanged. Eleven days later on June 18th, seven more raiders including the civilian William Campbell and his friend Private Shadrach and two of the three NCOs were also hanged as spies. The remaining 14 young soldiers were placed in prison camps to await what they assumed would be a similar fate. Bold, courageous and with nothing to lose they engineered a daring escape four months later in which eight of them reached safety. The other six were recaptured and brutally punished. It was these six young men, recently released in exchange for Confederate prisoners, who now stood before the Secretary of War to recount the tale of their ordeal. The Secretary was moved by the story. Then a thought crossed his mind and he stepped briefly into an adjoining room at the War Department, returning momentarily with something in his hand. "Congress," he told the young men, "has by recent law ordered medals to be prepared on this model. Your party shall have the first; they will be the first that have been given to private soldiers in this war." 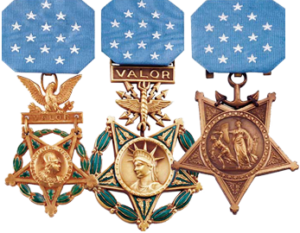 Then he stepped before the youngest of the group, Private Jacob Parrott and presented the first Medal of Honor ever awarded. When he had followed suit with the remaining five he walked them to the White House to meet the President, setting the stage for a tradition that would dominate similar presentations beginning some half-century later. The following September, 9 more of the raiders were presented Medals of Honor for their participation in the raid. Eventually, 19 of the 24 men including four of those hanged as spies were awarded Medals of Honor. As civilians, neither James J. Andrews or William Campbell were eligible for the award. Private Schadrach had served, been tried and hanged...under an assumed name.